Some designers say that bathrooms should be an entity unto themselves — fun little jewel boxes that don’t necessarily relate to the rest of the house. Not so for this Jacksonville, FL, residence designed by Lauren Leonard, where these two bathrooms fit the color scheme of the home. The designer wanted the swanky guest bathroom to make sense with the spaces all around it. “We wanted to create a seamless transition from the main living areas into the guest bathroom and the adjoining guest bedroom,” says Lauren. “The wallpaper was the inspiration for all of the design elements in this space, from the custom paint color on the vanity to the bone inlay mirror,” says interior designer Lauren Leonard. The jumping-off point for the guest bathroom was a stock bathroom cabinet in blue. (Cabinets already in stock — rather than custom — can save big bucks!) “I wanted to work off the blue cabinet color, and I found this amazing Galbraith & Paul wallpaper — Lotus in aqua — that coordinated with the cabinet color perfectly,” she says. Perfect for a bathroom on the coast, Galbraith & Paul’s Lotus design makes a bold statement as the wallpaper. Antique brass sconces bring in some aged patina to the new house. Wallpaper continues into the toilet area. With the wallpaper focal point, the rest of the room’s design selections easily fell into place. The marble countertops and antique brass sconces pull out the caramel tones from the wallpaper, Lauren explains, while the subway shower tiles tie into the paper’s creamy background. Brushed nickel plumbing fixtures complement the antique brass sconces. But wait … isn’t it tricky to have wallpaper in a bathroom, which is so subject to moisture? For one thing, guest bathrooms and powder rooms are probably better places to use wallpaper because they’re not used quite as often as a master bath. And also, says the designer, it’s all about application. “If you have wallpaper installed by a professional, they know the proper way to prep the walls and which type of adhesive to use to avoid any issues down the road,” Lauren advises. Soft blue tones continue into the master bathroom, where the homeowners specifically said, “No all-white bathroom,” the designer recalls. Light in tone, this spa-like retreat features colors from the sea, with striking walls once again being the star. “The master bathroom has lovely, vaulted ceilings, so for a dramatic effect, we ran the tile up to the ceiling,” says Lauren. The countertops are White Macaubus quartzite, which has the same beautiful green-gray veining that is found in the glass subway wall tile. The cabinets are painted in Sherwin-Williams Passive. 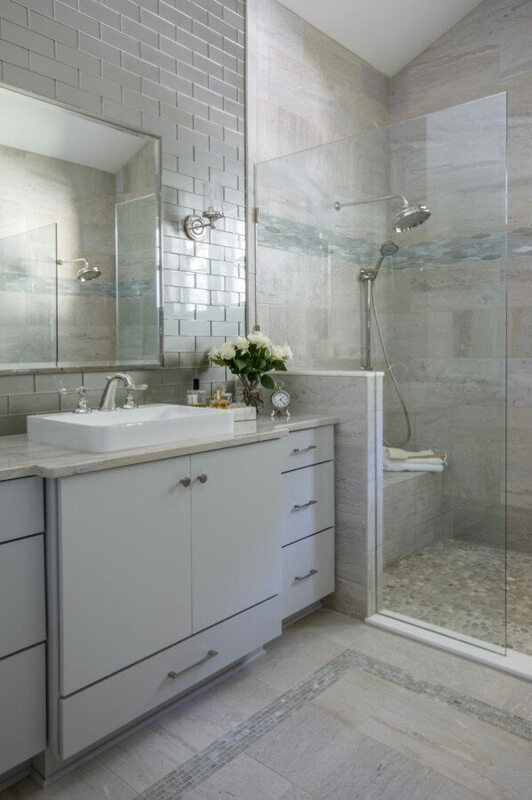 “My starting point in the design was the 3-by-8-inch glass subway tile in a beautiful green-gray color that I used on the walls above the vanities,” says Lauren. “The bathroom has lovely, vaulted ceilings, so for a dramatic effect we ran tile up to the ceiling.” Lauren then selected a coordinating glass mosaic tile with varying shades of green and blue. She mixed the patterns — 1-by-2-inch brick and hexagon — and applied them in different areas of the bathroom for visual interest. A coordinating pebblestone tile lines the floor of the shower. Glass tiles in different shapes were used throughout the bathroom, including this border in the shower. Polished nickel adds some sheen to the ocean-friendly colors. We’d say that mission was definitely accomplished!